Following your dreams in this day and age is a very bold move indeed. You get so many people who decide to play it safe and stick with the 9-5 rat race, all because they’ve convinced themselves that there isn’t enough money in the world, success can’t be for everybody, and a multitude of other things that just aren’t true. If you’ve got dreams that you’re unsure about following, this is the post for you. Maybe you feel scared, like it won’t work out, or even embarrassed of what people will think when you step into who you really want to be. Sometimes in life, you just need to be prepared to take a leap of faith. Put it out there. Tell people what you really want to do. Most importantly, remember that nobody cares as much as you think they do! People are way too concerned with themselves to care much about what you’re doing. Just go forth and say it out loud with conviction and see how it feels. You have every right to want to follow your dreams and achieve them. Although we just spoke about taking a leap of faith, you need to remember that it isn’t one huge jump to the finish line. This is what puts most people off. It’s all about baby steps. All you have to do is take very small steps towards achieving your goals each day. Carve out the time for it and you’ll get closer and closer to where you want to be. Now, it’s also important to remember that one path to a certain career or lifestyle may work for one person, but not for another. You should check out every available resource, as there are many paths that you can take to get to where you want to be. Look at the best colleges to become a pilot if that’s your dream, and see what it takes to get in. Maybe even look at free resources online, or short courses and workshops. Get an idea of what you can do and listen to your gut. We all have naysayers in our lives to some degree. Upsettingly, sometimes these people are family, or close friends. You have to remember that these people are only projecting onto you what they believe to be possible for themselves. That’s it. You don’t have to listen to them. It’s advisable that you spend less time with them, though, so you can make room for positive people with a similar goal and outlook to you. It’ll make all the difference! The place your mindset and belief system is in means everything to your progress and success. As Henry Ford once said, ‘Whether you think you can or you can’t, you’re right’. This is so true. If you think things won’t be possible for you, then they won’t be. If you think they are, then it won’t matter how many times you fail, you’ll keep on getting back up and doing it again until something sticks. That’s how winners are born. Something that tends to trip a lot of people up, is that they think that their progress should be linear. However, progress with just about anything is never linear. You’ll have peaks and valleys, highs and lows, and it’s important you embrace them so you continue on your journey with unshakeable faith. Find ways of tracking your progress so you can look at it over time, rather than looking at it week on week and feeling like you’re not getting anywhere. As long as over a long period of time your progress is spiking up, no matter how many times it dips down, you’re getting to where you’re supposed to be. It’s human nature to always reach for more. Don’t be surprised if you move the goalposts. It’s ok to change your mind, and totally normal. Just make sure you listen to your gut, trust your instincts. If something doesn’t feel right to you anymore, stop doing it. 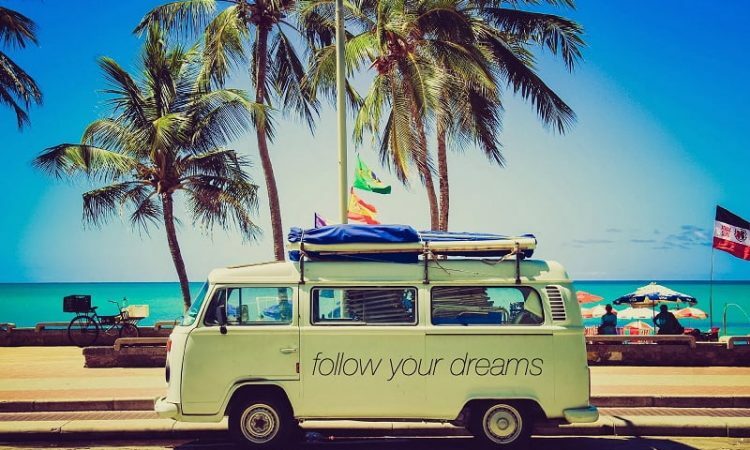 Ready to follow your dreams? Don’t wait any longer! Love such articles, mainly because I did take that leap. It can be done, albeit with a determined mindset. I’m so jealous Laurel! I am working towards packing in the 9-5 life. Am almost there, and I just can’t wait. Ally, it’s worth all the blood, sweat and tears to get here! I firmly believe that if you really want to do it, then you will. Thank you, Laurel. Any tips? Don’t look at your alternate life as unusual. Think of how many people make the change to their own lives, and it soon becomes the norm. I think that when you start to believe you’re the only one making such a leap, you begin to doubt yourself. You aren’t alone on this path. Laurel, that’s precisely what it boils down to; the mindset and attitude. Ally, if you do your homework beforehand, there’s no reason why you can’t sustain a change like this. Good luck to both of you.